As the missionaries met with Alma on that occasion, they acknowledged the Lord’s blessings unto them. 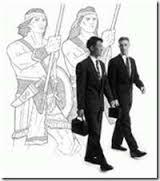 Through their missionary service, challenges and trials “they had waxed strong in the knowledge of the truth; for they were men of sound understanding and they had searched the scriptures diligently, that they might know the word of God.” They had learned and applied the Lord’s formula for success. As they reported their missionary labors, they noted what they had done to be successful missionaries. These principles are detailed in Alma Chapter 17-27 and subsequent chapters. A careful study of Alma Chapters 17 through 27 provides many insights that teach of what the Lord would have his servants do in the missionary effort. These same principles are applicable to the missionary labor of today. If followed, these steps will bring a missionary close to the Lord and will bring success in the Lord’s missionary labor. They are also applicable to future missionaries who now labor as member missionaries in preparation for full-time service. The king wrestled long and hard to receive forgiveness of his sins. (Alma 18:43) Ammon let the power of God work upon the people and did not rush the feelings and the spirit of the moment. Ammon recognized the hand of the Lord in the work and let the investigators bask in the “light of the glory of the Lord”. (Alma 19:6) Ammon let the power of repentance work upon the investigator. He supported the investigator in making the necessary commitments. Ammon knew of the Spirit of the needs of his companions and how to help them. (Alma 20:3) He worked to keep his companions safe. Converts wanted to remain clean and pure and to sin no more. (Alma 24:13) They were true to their covenants. Missionaries felt great joy with their converts. (Alma 26:31) They were forever after loved by the people whom they had taught and baptized. Compiled by Kevin V. Hunt from the writings of Alma in the Book of Mormon. A bishop interviews a prospective missionary. 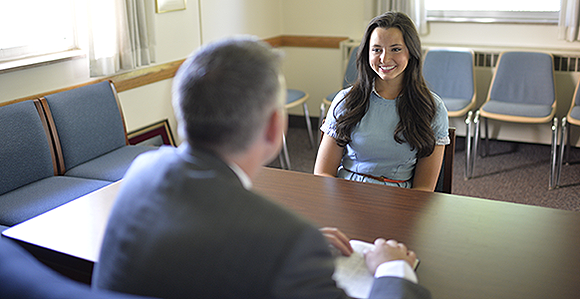 The First Presidency has released a set of standard interview questions to help ensure missionaries are worthy and physically, mentally, and emotionally prepared for missionary service. Prospective missionaries can use the questions to gauge their preparedness and have candid talks with their parents and leaders. Learn more about the future of missionary work in the Church in this news release. See the frequently asked questions for more information. The First Presidency has released a set of standard questions for bishops and stake presidents to use while interviewing prospective full-time missionaries. “Church leaders desire that this sacred time of service be a joyous and faith-building experience for every missionary, from young men and women to senior couples,” according to materials that accompanied the official letter dated October 20 to stake presidents and bishops. President Gordon B. Hinckley emphasized the importance of having good mental and physical health while serving a full-time mission. “[Missionary] work is rigorous,” he said. “It demands strength and vitality. It demands mental sharpness and capacity. … Missionary work is not a rite of passage in the Church. It is a call extended by the President of the Church to those who are worthy and able to accomplish it. Good physical and mental health is vital, … for the work is demanding, the hours are long, and the stress can be heavy” (“Missionary Service,” First Worldwide Leadership Training Meeting, Jan. 2003, 17–18). Priesthood leaders use standard questions for baptism and temple recommend interviews, but until now, a list of specific questions for interviewing missionary candidates has not existed. The questions do not indicate a change or addition to the requirements for full-time missionary service. They reflect the same standards found in the scriptures, Church handbooks, and other Church materials. Those considering missionary service can use the questions to gauge their own preparedness and have meaningful conversations about the qualifications for missionary service with their parents and priesthood leaders. Parents are encouraged to take an active role in helping children prepare for missionary service by helping them understand the qualifications and live the standards. According to the Frequently Asked Questions document provided by the Church, information relating to the physical, mental, and emotional preparedness of the missionary candidate will be shared with medical professionals in the Missionary Department and will help in determining the best assignment opportunities for missionaries. For worthy candidates not eligible for full-time service, priesthood leaders can help identify other appropriate service opportunities, such as serving as a Church-service missionary, volunteer, temple and family history consultant, temple worker, and more. Parents and leaders can help youth understand that the Lord values all of the ways His children serve Him, share His gospel, and build the kingdom. “Young men and young women with serious mental, emotional, or physical limitations are excused from full-time missionary service,” Elder M. Russell Ballard of the Quorum of the Twelve Apostles said. “They shouldn’t feel guilty about that. They are just as precious and important to the Church as if they were able to go into the mission field. “But while they don’t serve full-time, they can take every opportunity to find and help people join the Church. They can be member missionaries in college, at work, and in their neighborhoods. They ought to go forward, have a wonderful and full life, and help build the kingdom wherever they are” (“How to Prepare to Be a Good Missionary,” New Era, Mar. 2007, 6–11; Liahona, Mar. 2007, 10–15). Share interview questions with all prospective full-time missionaries and their parents before the interview and encourage them to review and discuss them. Discuss the interview questions as a ward council. Consider a fifth-Sunday discussion or other forum to share the interview questions with the adults and discuss ways parents can help youth prepare for missionary service. Share the interview questions with young men and young women beginning at an early age to help them understand the standards and qualifications for full-time missionary service. 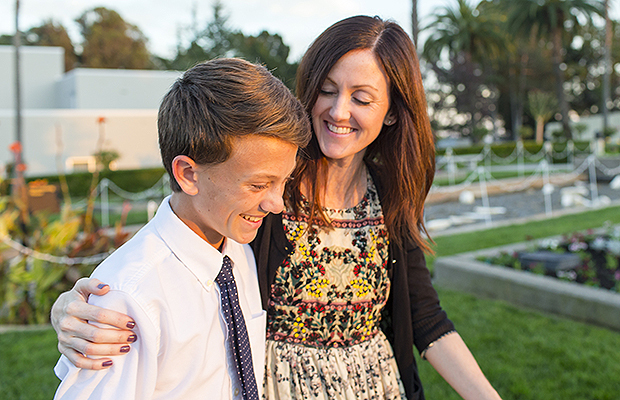 Take an active role in helping your children prepare for missionary service. Share the qualifications for missionary service with your children and help them in their efforts to understand and live the standards. Use interview questions as topics for family home evening lessons and discussions. The Priesthood and Scouting together are great tools in missionary preparation for your young men. Here is how one Deacon’s Quorum totally correlates all of their actions with their Scout troop. Very impressive… check them out! They seem to be doing it all right! A couple of weeks ago I blogged LDS Varsity and Venturing Changes Underscore need for Missionary Training on this site – an article about coming changes in LDS Scout units for older boys. I commented about the need for even better missionary training at home following these changes. Admittedly, the new look of older Scout programs will be a rather major challenge for us to face. But, with our united efforts, it will still be possible. In the aftermath of the LDS decision about Varsity and Venturing, the Deseret News published statistics that were rather interesting. These statistical charts showed that the average age of youth achieving the Eagle rank nationally in the BSA is 17.3 years. Pretty daunting news. And with the coming changes, this means that we will all have to work harder to make it happen – and probably earlier. So, what are we to do? What is to be done? How can the boys remain as Scouts and how can they achieve their advancement – and particularly the leadership requirements. All good questions! Well, I have had a few thoughts on the subject – and which I would like to share with you now. First … at the time of the annual BSA rechartering with the Church, the person in charge of completing the charter process should take extra care to contact each and every one of the boys turning 14 after January 1st (and their parents). (This will be an ongoing question critical in the first year – but to be answered each successive year.) Each boy should be willing to make a commitment right then about whether or not they want to be Eagle scouts. And this will be kind of a major decision for them. Do they want to follow the family and church tradition? Or are they going to say that they are done and satisfied where they are? All boys wishing to continue their Scouting connection (and adults who work with them) will still need to recharter with the troop. That will mean new applications for all older boys. It is very important that the registration remain current without any break. If there is a lapse, they may not be able to ensure that they have tenure and leadership for the necessary time. Boys can’t wait until they are seventeen plus and then suddenly reregister to become a “death-bed eagle” before they turn 18. One of the saddest days of my life was having to tell a Scout in such a situation that it just was not possible for him to complete his Eagle award requirements before he turned 18. He was a sad young man. Another key for the leadership requirement – and tenure – is to remember that the time for these can start as soon as the Scout has earned his Star or Life awards. Remember too, that a Scout needs to have six months between Star and Life and again from Life to Eagle. But say a young man gets Life three or four months before his 14th birthday. That three or four months can count toward the next rank IF the Scout is both registered and in a troop leadership position. So, it is rather critical to make sure that every young man is in a troop leadership position. Good record keeping is paramount. Another key will be working with the council to make sure that all of the current advancement records – from whatever unit – are all transferred to those registered in the troop – after the rechartering decisions. For many years I have been the advancement chairman for all three units – Scouting, Varsity and Venturing – in my own ward. And I believe that we have a pretty strong Scouting program and support in our ward. We have a fabulous 11-year Old Scout leader in Jonathan Nichols. That guy is a saint! He has worked overboard to ensure that each boy (who wants to) graduates from his program as a First Class Scout. And the Scout troop leaders have also been great. 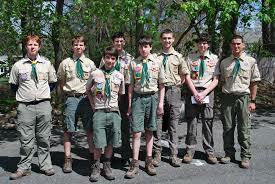 Most of the boys graduate from Deacon/Scouts as Star or Life Scouts. And then they all struggle to get the other requirements completed. A few boys get it done about age 15 – which is excellent. And still, like the National BSA statistics, the majority still get ‘er done when older still. And this is always a challenge … since by that time, the “fumes” have all kicked in (that’s car fumes and perfumes) and this makes for a major impact on the boys and their advancement. This questions kind of shocks some of the newer kids. We then talk about how parents, leaders, and others can assist them, but in reality, it is their own personal decision to become an Eagle Scout – and it is their own personal duty to take charge and make this happen. After that decision time, older Scouts can push themselves forward to make it happen. But, we have seen that often this doesn’t happen on their own. It will take help from all of us to achieve the goal. Next then, is that it will probably take a strong advancement person or someone else to help the youth stay on track. The advancement chair can (as always) continue to encourage and talk with the boys individually in the hall etc. to help motivate and inspire. Being ready with the updated advancement records of merit badges and rank dates can be very helpful. That brings us to the subject of how to stay in the troop and how to achieve leadership requirements. I guess this is a time to share my own personal experience. I earned my own Eagle Scout award just before I turned age 14 (and so did my four Eagle brothers – and I admit that I didn’t have to be prodded by Mom and others to do it). As per the church system, I moved up into the next upper level – Venturing Exploring (that was before Varsity Scouting). In that program we had grandiose plans. We planned to go to Hawaii. But, after all of that planning – and a steady diet of basketball – we ultimately didn’t even make it to the giant Arizona metropolis of Sunflower, Arizona. I lasted only about six months in that do-nothing program. I then made the choice to go back to the Scout troop and remained there until I went on my mission. Now, I know that I was a bit unique, but it was a glorious time for me. I conducted merit badge classes for my younger troop brothers. I kept the troop records. I became the troop’s Junior Assistant Scoutmaster – a fabulous title and truly wonderful job for an older Scout. I served more like an adult in the troop. I did not report through the SPL but he reported through me to the Scoutmaster. I have already blogged recently about how I became the catalyst to take our entire troop from Arizona up to the National BSA Jamboree in Farragut, Idaho. I became the Webelos Leader – and then 11-year old Scout (Blazer) leader when legally too young to do so. And it was all a grand experience for me – and my fellow Scouts. I loved the leadership opportunities. In our upcoming situation, I believe strongly that the Troop Guide position is perfect for some of our LDS older Scouts. This BSA position counts for Eagle advancement and is actually quite flexible in its job description. And you can have every boy – if needed – be a Troop Guide. It is flexible enough that you can use the position – and the boy – to help meet the needs of the older Scout himself – as well as other Scouts in the troop while getting in his own leadership requirement time). Now you have probably not even heard of this Troop Guide position because it really has not existed in the LDS church – because all of our boys have moved up to Varsity and Venturing at the specific ordination ages – and thus have by-passed the Troop Guide opportunity. The Troop Guide is a fabulous position but no one knows about it. The way it works, an older Scout is registered with the troop. And he is assigned a patrol – either a new-Scout patrol or even an older-boy patrol – or he serves at large in the troop to multiple patrols. He is an instructor. He is preassigned specific troop or patrol meetings to teach Scout Skills – or even merit badges. He does not have to attend every troop meeting but would be there at least once a month – but perhaps more. (If this is to occur, the troop meetings may need to be on a night other than the Teacher/Priest meetings so that he can go to both – or he would have to miss his Teacher/Priest meetings when assigned as an instructor in the troop. Create activities that are fun and interesting to the older boy patrols. Work with ASM for the Older Boy Program in selecting merit badges to work on at weekend campouts. Attend Patrol Leaders Council (PLC) meetings. Prevent harassment of new Scouts by older Scouts. Refresh older boy patrols in the basic Scout skills. Regularly attends troop meetings, troop campouts, and troop events during his service period. Enthusiastically wear the Scout Uniform correctly. Advise patrol leader on his duties and responsibilities at Patrol Leaders’ Council (PLC) meetings. Attend Patrol Leaders Council (PLC) meetings with the New Scout Patrol Leader. Help Assistant Scoutmaster train new Scouts by older Scouts. Guide new Scouts through early troop experiences to help them become comfortable in the troop and the outdoors. So, in summary, the Guide would be a leader kind of between the Patrol Leader and the adult leaders. He could work specifically with the new Scout patrol – and in this role (kind of like a Den Chief – but to older Scouts) he would teach and train Scouts in specific Scout skills. He could do this with a group or with a couple of boys on their own. He could be perfect to work with two or three boys who are behind and need some individual attention. He could be preassigned to teach specific skills at troop meetings or campouts. If on a camp-out, he should not be there to goof off but again to teach specific skills, be the example, wear the uniform, etc. If you have a group of these older Scouts, they could be their own patrol in troop meetings and on outings. Of if you have only a couple of them, let them cook and hang out with the adults. Plan ahead and give them specific leadership tasks. With advance notice, they can plan ahead and be prepared to be a true teacher and guide. The Troop Guide is flexible enough for the troop to kind of custom design a role for each young man – with definite things that they should accomplish in their service – new Scout patrol, scout skills training at troop meetings and/or campouts, or by individual assignment to specific Scouts. Older Scouts can also attend Scout Camp (again not as a goof off – but as a troop leader). And older Scouts can also be encouraged to attend NYLT and other youth leadership training opportunities through the council and the troop. Another idea that I have been toying with is to be a catalyst – to start my own “Super High Flyin’ Eagle Battalion troop. In such a troop, I could invite any and all older boy Scouts (from all around our town) who very seriously have decided they want to become Eagle Scouts. I am still thinking of this option since it could be real fun with a team of die-hard dads who loved Scouting and want to give their sons the opportunity to also achieve the Eagle Scout Award. I haven’t committed to this yet, but it is making me think and dream a bit. I hope that these ideas may be helpful to you. I would welcome comments about your own thoughts and how to make a success of the coming opportunities. Let’s all take a personal interest in the older Scouts and give them opportunities to be true leaders – using the skills and training they have already received as Scouts. Help each young man customize a plan for his leadership requirements and the growth of him and his fellow Scouts. It could be exciting! Journal keeping is a sill that all prospective missionaries could or should develop in preparation for a mission. And a journal as a missionary is a special blessing – both now and forever after. Journals can bless ourselves and all of our family members – and maybe others too. I began keeping a journal on May 20, 1973 – when I was age 18. On that Sunday morning, I was in a young adult Sunday school class taught by a former Bishop, J. Darwin Gunnell. On that occasion, he taught us from the words of the current prophet – President Spencer W. Kimball. “I am glad that it was not I who was reprimanded, even though mildly and kindly, for not having fulfilled the obligation to keep my records up to date. “This great record included not only the movements of his people but events from his own personal life. “No one is commonplace, and I doubt if you can ever read a biography from which you cannot learn something from the difficulties overcome and the struggles made to succeed. These are the measuring rods for the progress of humanity. “As we read the stories of great men, we discover that they did not become famous overnight nor were they born professionals or skilled craftsmen. The story of how they became what they are may be helpful to us all. “Your own journal, like most others, will tell of problems as old as the world and how you dealt with them. “Your journal should contain your true self rather than a picture of you when you are “made up” for a public performance. There is a temptation to paint one’s virtues in rich color and whitewash the vices, but there is also the opposite pitfall of accentuating the negative. The truth should be told, but we should not emphasize the negative. The good biographer will not depend on passion but on good sense. He will weed out the irrelevant and seek the strong, novel, and interesting. “Your journal is your autobiography, so it should be kept carefully. You are unique, and there may be incidents in your experience that are more noble and praiseworthy in their way than those recorded in any other life. There may be a flash of illumination here and a story of faithfulness there; you should truthfully record your real self and not what other people may see in you. “Your story should be written now while it is fresh and while the true details are available. “A journal is the literature of superiority. Each individual can become superior in his own humble life. “What could you do better for your children and your children’s children than to record the story of your life, your triumphs over adversity, your recovery after a fall, your progress when all seemed black, your rejoicing when you had finally achieved? “Get a notebook, my young folks, a journal that will last through all time, and maybe the angels may quote from it for eternity. Begin today and write in it your goings and comings, your deepest thoughts, your achievements and your failures, your associations and your triumphs, your impressions and your testimonies. Remember, the Savior chastised those who failed to record important events. So, my friends, I took the challenge from my former Bishop and from the Prophet. I went home that day and found a little notebook and began writing. Later I began purchasing nicer journal volumes. And the truth is that from that day forward – from May 20, 1973, I have literally made a DAILY entry in my journal for EVERY day since that time. That now equates to over 150 volumes and 30,000 plus pages on my life and those I love or whom I come in contact with. These journals have been a great blessing to me and to our family. We are very frequently found researching past volumes and it is amazing and wonderful to read these entries. There has been much that is mundane that has been recorded but in the process of daily entries, there is much that is fabulous. The journals show my progress made in life, how the Lord has guided my life and the great blessings given us of the Lord. And this has been magnificent! A suggestion for any missionary: … Keep a detailed journal of your experiences. Then on your weekly P-day, use your camera or a scanner and take pictures of each journal page. You can actually do this the night before the P-Day. You can then send this home as your weekly letter. (And this will save you time at the computer on your actual P-Day.) Several of my children did this while on their missions and it worked wonderfully. (And as Dad, I typed up the entries and sent them out in e-mail messages to a large list of their friends – both family, members and friends (including as many non-members as possible.) I highly recommend this system to you. Develop a set time each day to write and do this religiously – this could be at lunch time, study time, just before dinner, at the end of the day, etc. The key is to be VERY CONSISTENT! Well, there you have it! There is your challenge! I hope you will take up the journaling challenge (at whatever your age) and that you will find great joy and happiness through the years as you and your posterity reap the blessings of such an effort. Today the LDS Church made a historic announcement about its plans to drop the Varsity and Venturing programs previously held in partnership with the Boy Scouts of America. You can read about these changes on my recent blog as published on thescoutingtrail.com (Trapper Trails BSA Council in Ogden, Utah) at this link: Varsity and Venturing Changes in the Church. The article also contains some helpful information about program planning – still the heart of programs for church youth – under whatever name or program. These are still correct and true principles! The LDS/BSA changes for older boys again underscores the need for home and family missionary training. 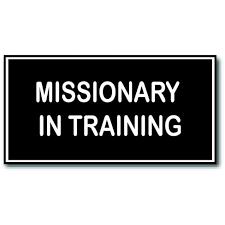 This website is dedicated to the principle of home missionary training and specifically the Missionary in Training program. This program can help parents and families fill in gaps and take more control and management of the training of their/your own missionaries. I encourage you to take another look at it – and contact with questions about the program opportunities.